The new 'First Floor' at Avon Mill is home to a seasonal collection of elegant, original and limited edition artworks. And new, for the spring collection, extends to the groundfloor Cafe too, so two floors of art to peruse! Each collection showcases artists local to the South West, with occasional exhibitors from further afield, and features a mix of amateur and professional artisans. Collections change three times yearly and is open daily, 10am-5pm. Whilst viewing the art collection, why not relax and enjoy a coffee or glass of wine or may be even take lunch, just order from the Cafe below. There are comfy sofas as well as tables and chairs, so you can sit back and soak up the calm and creative atmosphere. you can register now click here. Our spring collection features the work of the following South West artists. Rosie's unique style of painting pushes the boundaries of botanical art and whilst fitting loosely into the tradition of the genre, the large size of her works and intense richness of colour sets her apart from her contemporaries. 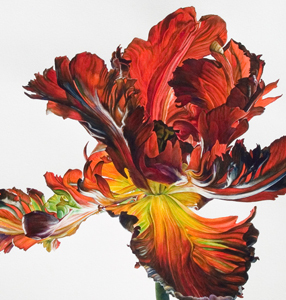 Her flower paintings have a sensuous quality and drama that is unrivalled in contemporary botanical painting. Rosie is a Devon based artist and printmaker who usually exhibits in London, so we are privileged to host her first exhibition of works in the South West. She is a recipient of five gold medals from the Royal Horticultural Society for her work and has won the Royal Academy miniature award. Sarah's work pays attention to the natural world. Each piece takes a while to create, demanding time, attentiveness and a process of slow contemplation. Her exceptional works have been exhibited since her university days (where she won awards for drawing and painting). Over the past ten years she has exhibited in various galleries including London, Bath and America. 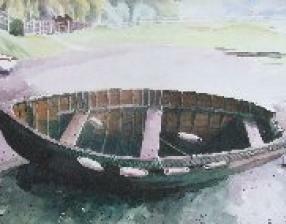 Locally, her work featured in the 'Slapton Ley Project' and she was the 'artist-in-residence' at the Sharpham Estate in 2007. Nick lives locally but originally trained at Maidstone Art College, followed by three years at the Royal Academy School, London. 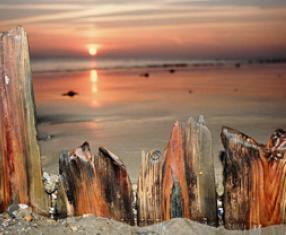 He has taught art and design and was formerly Director of Art at Brighton College in Sussex. He has painted throughout his teaching career, with solo exhibitions in London, Brighton and Oxford. As an artist, his paintings emphasize the importance of drawing and draughtsmanship. 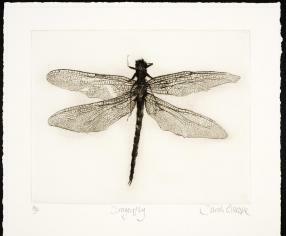 Allison is a painter, printmaker and sculptor, based in Totnes. Her works hold a quiet narrative - she wants you to be drawn in and left wondering. 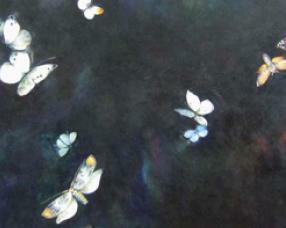 The butterfly series is inspired by faded, dark medieval tapestries. She finds the way that black is not black - so many layers of blue, brown, red and green - fascinating. It takes time to build up the layers in oil paint. The butterflies themselves are accurate portrayals - to appear as having just been disturbed and trying to escape or avoid one another. Having lived in North Devon for the past 35 years, the inspiration from this part of the country has given Bob the opportunity to explore the ever changing seasonal variations of the diverse coastline. He likes to record these changes through his photographs in a less conventional, somewhat abstract way.